Amber graduated with an Honours Bachelor of Science with high distinction in 2016. She completed a specialist in pathobiology as well as a minor in immunology and a minor in psychology. Amber has received a diverse array of awards for her academic, extracurricular, and research accomplishments. 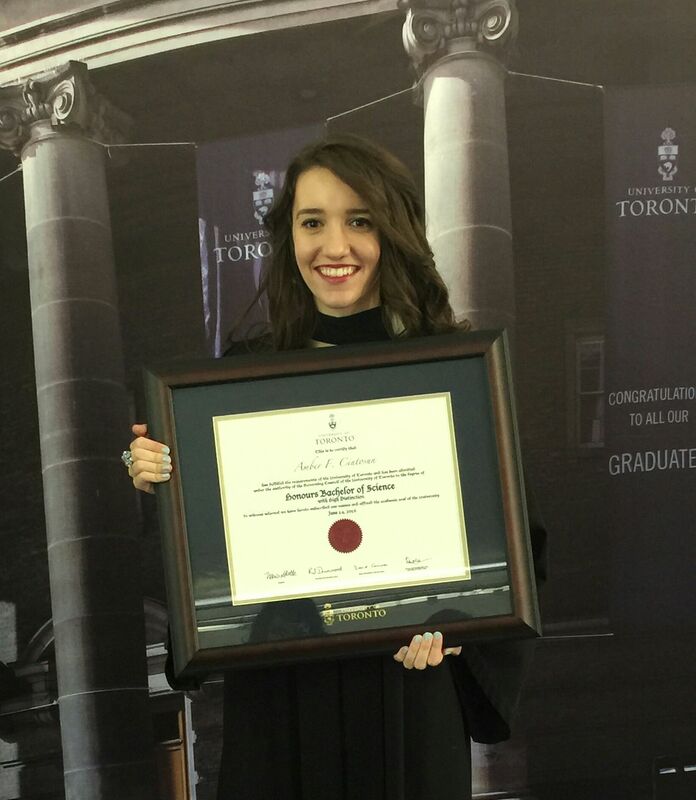 She was awarded the University of Toronto Scholars Program admission and in-course scholarships for all four years of her undergraduate degree. Amber is a recipient of a number of awards from Trinity College, including the Provost’s Scholarship and the Chancellor’s Scholarship. Amber also won the Allan Gornall Award for graduating as the top student in the Laboratory Medicine and Pathobiology (LMP) department. Amber has also played an active role in research. Through the Research Opportunity Program, she conducted preclinical research experiments at the Centre for Addiction and Mental Health (CAMH) under Dr. Bernard Le Foll. There, she worked on a rat model to discover pharmacological treatments that would prevent relapse to nicotine and gambling addiction. Currently, Amber is conducting research at the University Health Network (UHN) under Dr. Ozgur Mete. Since 2014, she has been investigating the biomarkers that distinguish specific subtypes of pituitary adenoma through retrospective and epidemiological studies. With a publication expected for 2017, Amber and her supervisors at UHN hope to improve the diagnostic system of the World Health Organization (WHO) for pituitary adenomas. Amber has won LMP scholarships for this research endeavour and achieved bronze prize for her poster presentation in the LMP Summer Student Research Program. Amber seeks to become both a physician and an academic. She is currently pursuing her MD at the University of Toronto, Faculty of Medicine (class of 2020).